What choice: a fibre drum or a steel drum? Which are the advantages and disadvantages of the two solutions to contain dry and pasty, dangerous and nondangerous products? 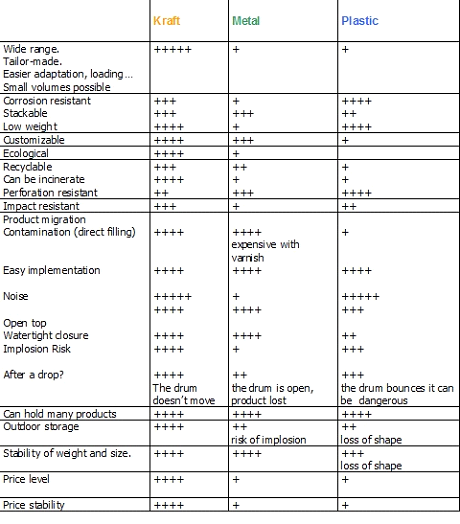 As you can see it on this comparative table, the kraft drum has many advantages compared to the steel drum. As regarding many criteria, the fibre drum is largely winner. It is much lighter, therefore easier to handle. It is considerably less noisy when one moves it in the workshop. The kraft drum is more economic than steel drum. Its price remains even more stable because the cost of the raw materials fluctuates less. It can be designed tailor-made, even produced in small series. It is easily customizable, because it can be decorated and equipped on all its height, with painting or in serigraphy. Its wide range (varied heights and litrages) enables him to adapt more easily to the chains of conditioning, with the maritime containers or trucks. What facilitates its palletization and optimizes its loadings. Thanks to its natural raw material (the kraft), the fibre drum is much more ecological. It is easily incinerable. It is thus recyclable and can be eliminated more easily. In the event of fire, it is not likely to implode, which can happen with a steel drum. Against corrosion, the fibre drum is more resistant than metal, it does not rust! It can hold easily the temperature variations. It is more resistant to the shocks: it is even able to recover its shape and “is not dented” as a metal drum. In the event of fall, the kraft drum retains the product.